January 30 2017. The Masters Individual Grand Prix requires a combination of ability and dedication. It is tough to win without the ability to finish on or near the podium most of the time. But that is not enough; one must also contest a number of Championships. Most of the winners below ran in 5 events or more and all but one raced in at least 4 events. Like Woody Allen famously said of life, 95% of a Grand Prix is showing up! It is no surprise that most of the Individual GP winners are also being counted on by their teams for the Club Grand Prix. Hats off to the winners and, indeed, the top 3 in each division! Hurray! As in the Club GP, zero to 100 points are awarded for each contest, but in 5-point intervals, not 10; individuals must contest a minimum of 3 events to win a Grand Prix award. The sum of points scored in the best 5 events represents the Individual’s Grand Prix total. High scores get the top prizes. W40-44 Sixty-three athletes contested events in this division. The top 4 point-getters in the Grand Prix were GVH’s Wakenda Tyler, Atlanta’s Stephanie Whitis, Melissa Senall, Tyler’s teammate, and TNT’s DaBeth Manns. Tyler had 5th place finishes at Dedham and Flint and a 6th at Syracuse for 235 points heading into the XC meets. Her teammate, Senall, had a 6th place finish at Dedham but a 4th place finish at Flint. She missed Syracuse so went into XC with 160 points. Whitis had 8th place finishes at Dedham and Syracuse to lie in 3rd with 130 points. Manns had 100 points from strong showings at Flint and Syracuse. Whitis took 4th at the Masters 5K XC that Tyler and Senall missed, giving her 215 points heading into Club XC. Tyler had a 20 point lead on Whitis who, in turn, had a 55 point lead over Senall. All 3 were entered at Club XC. Whitis would need to outplace Tyler by 5 places to reverse their ordering. Senall had to finish 12 places ahead of Whitis, not impossible in a big race like Club XC but definitely difficult. Tyler finished 6th, followed by Senall in 11th and Whitis in 12th. That cemented the GP win for Tyler and the 2nd place finish for Whitis. Senall, the defending GP champion in this division, finished 3rd. W45-49 Forty-eight athletes contested Championships in this division. But only 1 contested the minimum of three events required to win an award in the Masters Grand Prix. Last year there were four athletes who qualified for an award in this division. Last year’s Champion, GVH’s Audra Naujokas-Knapp, competed in only 1 event this year. I hope that a few more runners will contest the minimum next year and give this year's winner a run for her money. The winner this year deserved the win in every way; it is unlikely any other runner in this division could have beaten Atlanta’s Sonja Friend-Uhl in a head-to-head contest. In the four events Friend-Uhl entered, she came away with the divisional victory each time for a total of 400 points. Five other runners entered two events; one more and we would have had another runner on the podium. W50-54 This year 75 athletes contested Championships in this division. Last year GVH’s Carol Bischoff, Athena’s Marisa Sutera Strange, and Jane’s Elite’s Kathleen Cushing-Murray finished 2nd through 4th behind the Champion, Lorraine Jasper, Strange’s teammate. This year was another story as Jasper moved up to the W55 division. The three contenders last year plus 1 newcomer were going to sort out the podium. Cushing-Murray and Bischoff got on the board first with finishes at the Brea 8K, and Cushing-Murray got 1 head-to-head victory over Bischoff, finishing 2nd to Bischoff’s 13th. Strange was the only one of the 4 to compete in the 10K at Dedham and she made it count by walking away with the division win and 100 points, a practice she would continue. That left Strange 5 points ahead of Cushing-Murray but Cushing-Murray regained the lead with her 1st place Half Marathon finish at San Diego. Strange regained the 5-point lead with a 1st at the 1 Miler at Flint while Bischoff shored up her third place standing with a 6th place finish. 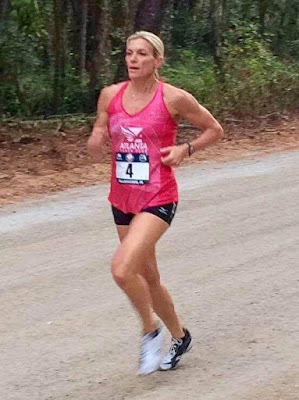 The 5K at Syracuse attracted not only Strange and Bischoff but also Trish Butler of the newly formed New Balance Tampa Masters team. Butler took 2nd to Strange’s first; Bischoff’s 12th gave her 160 points and a small lead over Butler for 3rd. Cushing-Murray relieved the pressure from Butler and kept the focus on competing with Strange for the win by taking 2nd in the 15K at Tulsa. Now she was only 10 points back from Strange and 185 ahead of Butler. 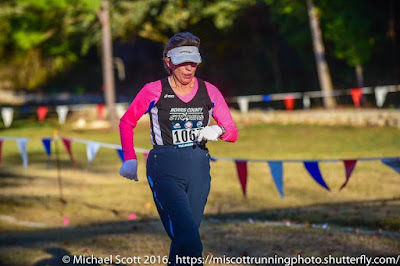 Strange put the Grand Prix Championship out of reach with a win at the Masters 5K XC event at Tallahassee; Cushing-Murray could not catch her with only one event left. Butler picked up her 2nd Age Division silver medal and 95 points, for 190 GP points, but Bischoff countered with a 6th place finish to run her total to 235. All 4 would contest the last event of the year, the Club XC Championships. Strange and Cushing-Murray had the GP 1st and 2nd places locked up but if Bischoff could finish within 8 places of Butler, she would win. Unfortunately for Bischoff, Club XC is often the most competitive race fo the year, bringing out many runners for whom this is their only USATF race. And so it went this year. Butler was only able to manage 4th but 11 runners came across the line after Butler and before Bischoff. That performance gave Butler the Grand Prix 3rd place in this division. W55-59 Forty athletes contested events in this division. 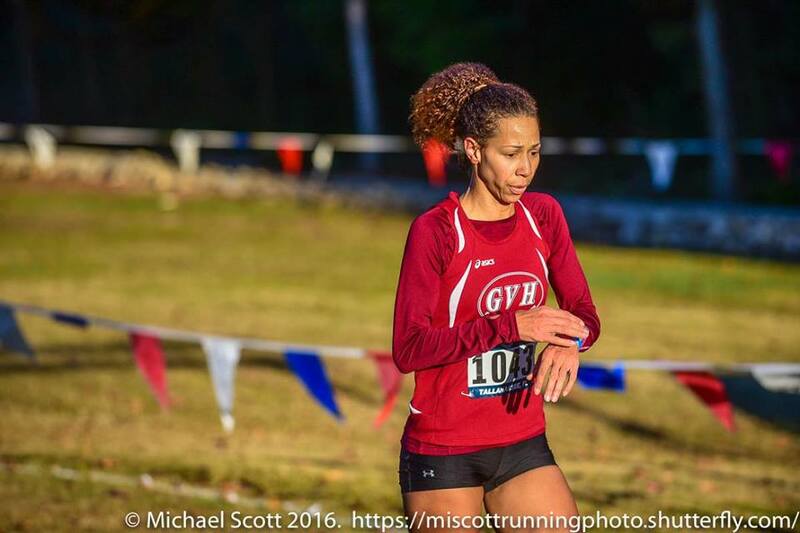 Last year Carmen Ayala-Troncoso was the only runner to challenge the eventual GP Champion, GVH’s Colleen Magnussen by putting together three competitions. This year Magnussen had 4 challengers –Lorraine Jasper, of the Athena Track Club, who moved up from the W50 group, Atlanta’s Mary Sweeney who only raced two events in 2015, and another newcomer, Susan ‘Lynn’ Cooke, of the New Balance Tampa team. Jasper, Magnussen and Sweeney all competed for the first time in the 10K at Dedham. This was the first time that there was a sign that Jasper was off her best. Sweeney took 2nd, with Magnussen 6th and Jasper 8th. Sweeney was the only 1 of the 4 to run at the Half Marathon in San Diego and was the strongest runner there, collecting 100 points for her efforts. That gave her the GP lead momentarily. But Jasper and Magnussen competed at the 1 Mile Run at Flint while Sweeney did not. Magnussen took 2nd to Jasper’s 3rd, leaving Sweeney in the lead with 195, Magnussen 2nd with 170 and Jasper 3rd with 155. Cooke made her first appearance at Syracuse capturing 90 point for 3rd as Magnussen finished 7th for 70 points, regaining the lead at 240. 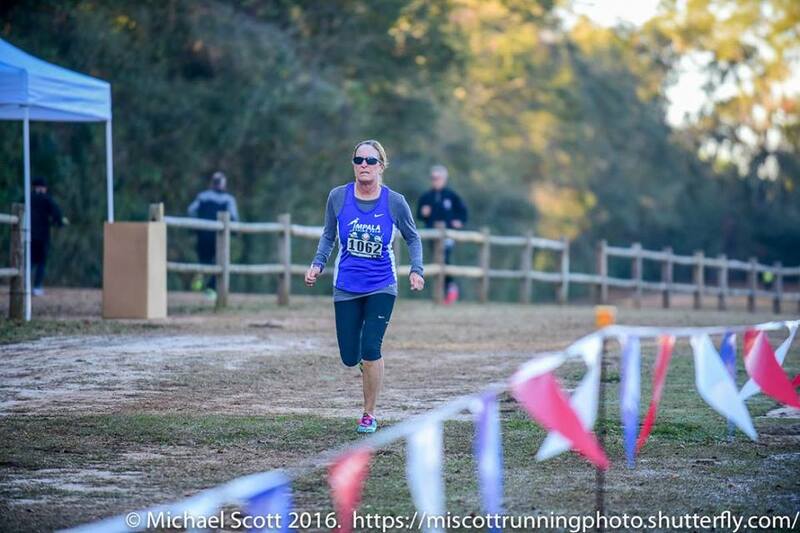 Magnussen, Sweeney and Cooke all ran at the first Tallahassee XC but Jasper was again absent. Cooke won that one, with Sweeney 3rd and Magnussen 4th. Magnussen led with 325 to 285 for Sweeney and 190 for Cooke. Sweeney could still catch her but as it turned out Sweeney did not compete in the last event of the year, Club XC. That gave the GP to Magnussen who gained another 45 points to land at 370 for the year; Cooke took the win and that 100 points moved her into 2nd ahead of Sweeney who finished 5 points back. Jasper finished 2nd in the Club XC, giving a sign of what she is likely to do next year and, of course, helping her Athena team to the Club GP win. But it was too late to get her on the GP podium as she finished 35 points back from Sweeney. W60-64. This year 35 athletes contested events in this division. Cynthia Lucking, Jill Miller-Robinett, Margaret Taylor, and Cynthia Williams were the top GP contenders. Miller-Robinett set her standard out by competing at Bend and taking home 100 points for her efforts. Running primarily for the benefit of her Impala team, she nonetheless took an early lead. 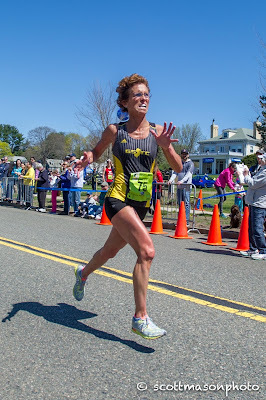 When she finished 4th at the 10K Championships in Dedham, ahead of her main rivals, Williams and Lucking, in 5th and 7th respectively, she not only extended her lead, she made herself the clear favorite to take the GP crown. They would either have to find a way to beat her or get to races she would not contest; both proved difficult. 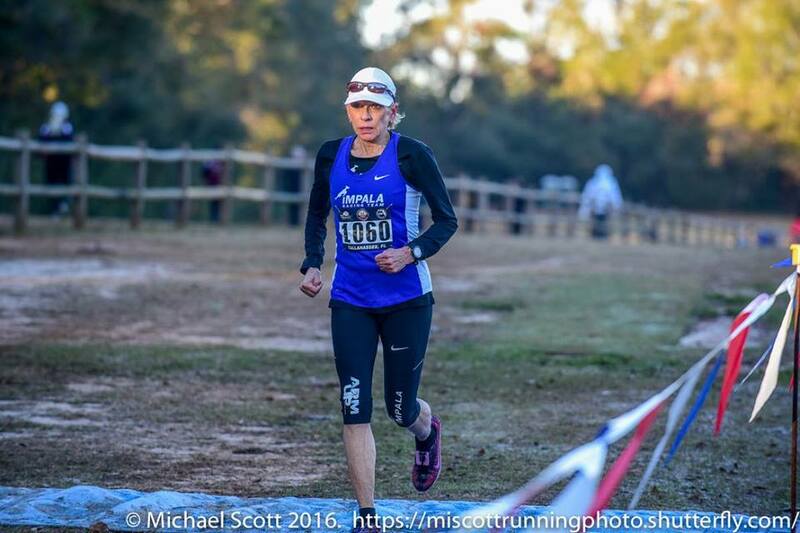 Williams and Lucking got to the 5KM Masters XC which Miller-Robinett skipped as they took 1st and 2nd respectively but Miller-Robinett negated that with her participation at Tulsa, which they skipped, finishing 2nd and getting 95 points. Apart from that they met at the 1 Mile, the 5K , and the Club XC Championships, with Miller-Robinett getting the better of Wiliams and Lucking each time. By the end of the year, Miller-Robinett had 480 points and the GP victory by over 100 points. The lead she established in the first race of the year grew throughout the season, a terrify one for Miller-Robinett. And perhaps it was fitting that Atlanta teammate, Lucking and Williams tied for 2nd with 325 points each. Another teammate, Margaet Meek Taylor was also in the mix but could not make it to enough events to rise above 4th. W65. Twenty-five athletes contested events but three stood above the rest, defending Champion, Jo Anne Rowland, her teammate, Donna Chan, and the challenger, Edie Stevenson. Like her teammate, Miller-Robinett in the 60-64 division, Rowland and Chan put their scores up first with 100 and 95 points, respectively for a 1st and a 2nd place at Bend in the 6 km XC race. They did not have long to enjoy their lead as Stevenson took first, 3 weeks later, at the 8K road Championship in Brea. Rowland took 2nd and Chan 7th in that race so Rowland was still 95 points up on Stevenson. Rowland and Stevenson met again at Dedham in the 10K and San Diego in the Half Marathon with Stevenson taking 1st to Rowland’s 2nd both times. Stevenson was edging closer but it appeared that Rowland might be able to hold her off. Stevenson experienced some relatively minor fitness issues between Brea and San Diego and those can sometimes derail a GP effort by limiting the number of events a runner can effectively participate in. There was only 1 event over the summer, the 1 Mile at Flint but both leaders skipped the race. At the end of the summer it was Rowland leading with 380 points and Stevenson at 300. Chan ran her last event of the year at Flint and her total of 335 after the 1 mile Championship was enough for 3rd place. This GP contest would be decided in the fall. It seemed certain that Rowland, along with her Impala teammates would tally at least 460 points; Stevenson would need another two events to beat her. 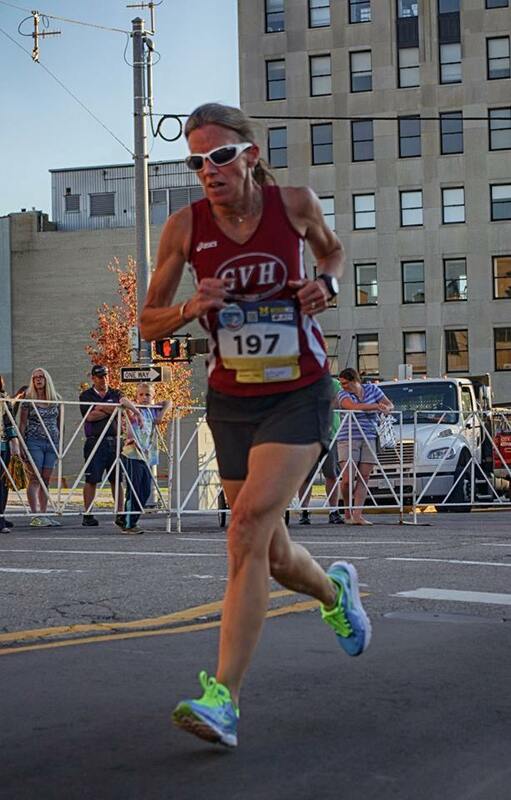 They both entered the 5 K Championships at Syracuse, running into the ‘buzz saw’ known as Kathy Martin. Martin took 1st, followed by Stevenson, followed by Rowland in 5th, probably nursing an injury herself. That pulled Stevenson within 65 points of Rowland. One more race might do it. As it turned out, they both entered the 15K at Tulsa and that did it; Stevenson took 1st and Rowland 2nd. Neither competed in the final XC events of the year so Stevenson took the GP title 495 to 475—quite a year-long tussle! W70-74. Of the 11 competitors who contested events in this group, only two, Dianne Anderson and Irene Terronez, were consistent enough in their participation to contest for the GP title. Both contested the 8K at Brea with Terronez gaining the early edge with a 2nd place to Anderson’s 5th. 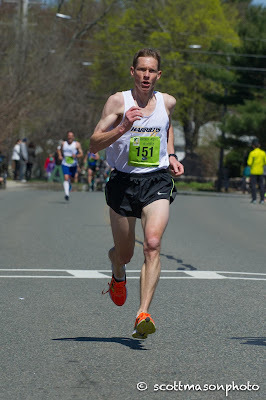 Anderson competed at Dedham in the 10K, taking 2nd place, but not in San Diego at the Half Marathon Championship. Terronez did exactly the reverse so heading into the summer, Terronez led 190 to 175, a very tight contest. Anderson moved ahead and then way ahead, by taking 2nd and 1st at Flint and Syracuse, while Terronez stayed away. Terronez won the 15K at Tulsa moving her to within striking distance of Anderson, trailing by only 80 points. But that was Terronez’s last event of the season, leaving the GP title to Anderson. The first place Anderson achieved at the National Club XC was icing on the cake! The GP title was hers by 180 points. W75. 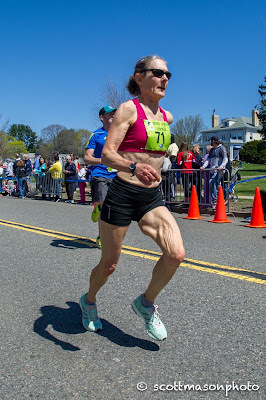 Eleven women contested this age division at various events during the year but New Jersey’s Madeline Bost was the only one to compete consistently enough to have a shot at the GP tile. Bost had to recover from a freak fall on a tricky portion of one of her training trails (where a number of runners of various ages have come to grief). Undismayed, Bost dusted herself off and made two trips from New Jersey to Tallahassee for the final 2 GP Events, the Masters 5KM XC Championship and the Club XC Championships. Those two wins gave her 285 points and the Grand Prix crown. M40-44. This was the second most contested division with 124 different runners competing at the 9 USATF Championship Events. 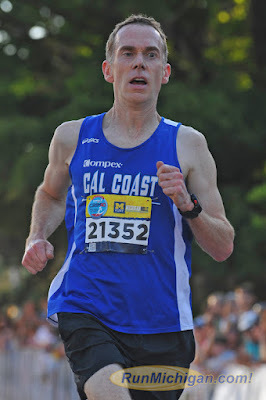 The talented runner from Cal Coast TC, John Gardiner, had his work cut out for him. Last year Gregory Mitchell, of the Bowerman TC, bested him for the GP crown by 40 points. Even though Gardiner tended to finish between 2nd and 4th in events, Mitchell went him a bit better by finishing 1st or 2nd. And there was some thought that Kevin Castille, the fastest Masters runner around, apart from Meb Keflezighi and Bernard Lagat, might contest more USATF championships. If so, that could complicate things. The 2016 season started out much as the 2015 season had started, with Mitchell establishing himself as the GP favorite with a 2nd place finish at Bend and a first at Brea in the 8K. Gardiner, on the other hand, was coming back from a niggling injury, finishing 10th at Bend and 4th at Brea. Castille, meanwhile, was focused on the Olympic Marathon Trials. 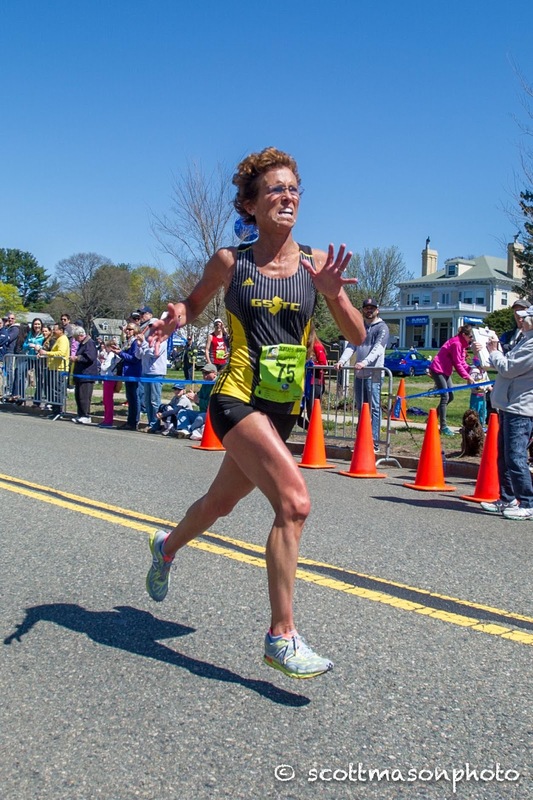 By May Mitchell was dealing with an injury and did not participate in the Half Marathon at San Diego. Castille ran his first event of the season, winning the HM Championship handily. Gardiner, now pretty much recovered from early season problems finished a strong 2nd. That moved him ahead of Mitchell by 40 points. Mitchell missed not only San Diego but the 1 Mile Champiionships at Flint and the 5K Championships at Syracuse. That allowed Gardiner to pad his lead with a strong win at Flint and a 2nd to Castille at Syracuse. Mitchell returned to action at Tulsa and, until encountering heat related problems late in the race, looked to have the win. In the end Gardiner was able to overtake and pass Mitchell who gutted it out to finish in 2nd place. That gave Mitchell 290 points to Gardiner’s 475. Mitchell could still beat Gardiner though if he ran the last two events and finished second or higher in each of them. Castille was out of the GP contest now as his maximum score even if he entered and won both XC events would be only 400 points. Castille’s 3 races was the highest number of USATF Masters Championships he has contested at least in the last three years. Is that a sign of things to come? Time will tell; it netted him 3rd in the 40-44 Men’s GP this year. 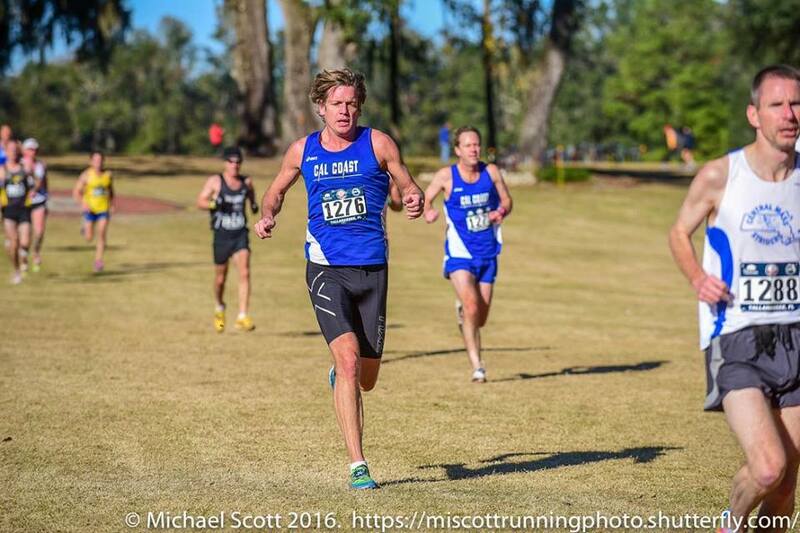 Castille won the last event of the year, the National Club XC Championship in Tallahassee; Mitchell and Gardiner followed in order. That gave Gardiner 480 points and the GP win; Mitchell took 2nd this time with 385. Castille’s 300 points was enough for 3rd place, 40 points ahead of Florida’s Danny Goodman who had 260 points, primarily from an 8th place finish at Bend and two second place finishes, at Dedham in the 10K and at the Masters 5K XC. M45-49. 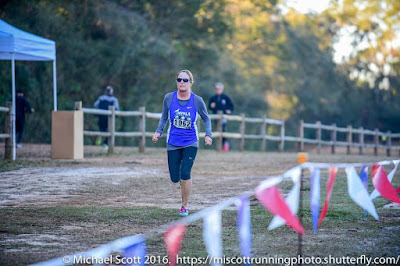 One hundred three runners contested the M45 division in 2016. The defending champion, Christian ‘Cush’ Cushing-Murray, started the season with a bang! He took a second at Bend but won the division at Brea. That gave him 195 points right out of the blocks. His chief rivals were likely to be his teammate, Michael John, ‘M.J.’ Stanley, Atlanta’s Eric Stabb, and Tim Van Orden of the Central Massachusetts Striders. Stabb took 4th at Brea to put 85 points on the board and Stanley finished 13th for 40 points. Not an auspicious start for Stanley but things got better. Cushing-Murray, meanwhile, was flying high not only at USATF events but he also won the Masters race at the Carlsbad 5000. When he won the division at the Half Marathon Championships in San Diego, Cushing-Murray looked unstoppable, with 295 points to his credit heading into the summer. Stanley picked up a 5th place finish in San Diego to move his total to 120 and install him in 2nd place. Van Orden got on the board with a 4th place finish at the 10K in Dedham. 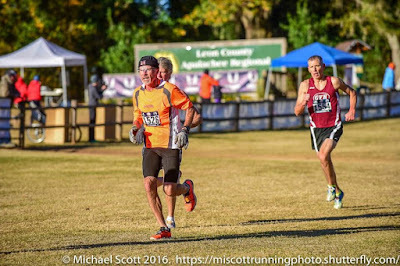 ‘Ol’ Man Injury’ reared his head for Cushing-Murray in mid to late summer; we did not see him in a Championship race the rest of the year, although he did show up to help ‘coach’ his Cal Coast teammates at Tulsa and Club XC. With Cushing-Murray out, Stanley stepped up for the team, taking 3rd at Flint and first at Tulsa, adding 190 points to his total and establishing him in the lead. Van Orden, in the meantime, picked up a 3rd and 90 points at Syracuse, moving him ahead of Stabb, who would not compete in a Championship event again until the 5K Masters XC Championships in Tallahassee. Stanley had 315 points heading into November. Stabb could not catch him even if he ran both XC events and won; Van Orden, on the other hand, was not out of it yet. He could move ahead of Stanley with two good performances in the final 2 events. The Central Mass striders were not going to make 2 trips to Tallahassee. Van Orden skipped the first XC race which gave the GP victory to Stanley. That was lucky for Stanley, who was nicked up and just running for the team at Club XC, managing only 15 points at the final event. That was enough to preserve his 30 point edge over Cushing-Murray, who took 2nd despite running only in Championship events in the first half of the year. Stabb ran the last two races of the year and was able to take 5th to Van Orden’s 7th in the group, edging him for 3rd in the GP race. M50. Last year, Greater Springfield Harrier teammates, Francis Burdett, and Nat Larson, along with GVH’s Mike Nier finished 1st through 3rd within 25 points of one another. This division had the most competitors at events during the year with 132. This year Burdett battled injuries off and on during the year with the result that he could not compete consistently at the top of the group and did not factor. Kristian Blaich who finished 3rd last year in the Men’s 45-49 division was moving up to the M50. I anticipated he would have a good shot at the top M50 GP spot. Blaich however was dinged up and missed the first half of the year. He came on strong in the second half, piling up 290 points in the 5K and the 2 XC events but it was not enough to be a factor. In the end it was a battle primarily between Larson and Cal Coast’s Rob Arsenault, in his first full year in the age group and Club Northwest’s Carl Combs. Although Combs is a terrific runner, he has a difficult time making very many Championship races. With the GP circuit starting on the West Coast, Arsenault and Combs took the early lead; Combs took 1st and arsenault 3rd at both Bend and Brea. GVH’s great journeyman runner, Dale Flanders, made the trip and got on the board with a 10th place and 55 points while Nier stayed home to heal up and be ready for later races. Larson and Nier made their first appearances at the 10K in Dedham, with Larson claiming 2nd place and Nier 8th. Flanders added another 50 points for 11th. By taking 3rd at the Half marathon, Arsenault established a gap with Combs who did not contest it, and extended his lead over the others. Heading into the summer, Arsenault was n first with 270 points, followed by Combs with 200, Flanders with 105, Larson with 95 and Nier with 65. Larson and Nier were going to have to step it up in the fall if they were to contend for a top 3 finish this year. Larson and Flanders were the only two to run the next 3 races at Flint, Syracuse and Tulsa. Larson took a 1st, 3rd and 2nd in those 3 races to add 285 points to his total and move within striking distance of Arsenault who added two 4th place finishes at Syracuse and Tulsa to run his total to 440. He had a 60 point margin over Larson. Combs’s 2nd at Syracuse gave him 295 points from the 3 races he had contested. That moved him ahead of Flanders who now stood at 275 and Nier 185. Flanders and Nier contested the final 2 races of the season but did not score enough points to move up into the top 3, settling for 4th and 5th respectively. Arsenault, Combs, and Larson all competed at Club XC. Combs could not catch Arsenault as his maximum possibility was 395. If Larson had an off day, Combs could pass him for 2nd. At Syracuse, Combs had defeated Larson but Larson got his revenge, besting Combs at Club XC, taking 2nd place to Combs’s 5th. Arsenault finished 8th for his team but was not able to pad his Individual GP total. That gave Larson 475 points and a 35 point win over Arsenault. Combs finished 3rd in the GP. M55-59. Last year the top three were Dave Bussard, Antonio Arreola and Brian Pilcher, with Thomas Dever and Gary Radford in 4th and 5th. This year it was an entirely different story; none of those 5 factored. Pilcher and Radford moved up to M60; Bussard and Arreola only ran 1 Championship event each this year and Dever did not run in any races. In the early part of the year Dever was focused on the Boston Marathon and he did not run any races after that until late November. No doubt for all of them it was a mixture of a focus on other prominent races and/or injury. Eighty-three individuals did contest the Championships in this division. Five rose above the rest: Kerry Barnett, Gary Droze, William ‘Hugh’ Enicks, Joseph Mora III, and Fred Zalokar. Enicks got out in front early with a 2nd place finish at the 8K in Brea and then locked horns with Zalokar in the Half Marathon in San Diego. Zalokar, renowned for winning his age group in all of the ‘Major’ Marathons, with the possible exception of Tokyo, was dropping down in distance but found plenty enough speed to take the win and the 100 GP points that went with it. Enicks, not far back, came home in 2nd to add 95 points to his total and maintain a substantial lead. Enicks, who also prefers the longer races, was not above competing in the 1 Mile Championships, however, where he nailed a 3rd place finish, adding 90 points to his total. Zalokar skipped that one but Barnett, of Playmakers Elite, and GVH’s Mora made their first appearances with Mora taking the gold and Barnett the silver medal for 100 and 95 points respectively. All 5 showed up at Syracuse, along with Bussard, who made his one Championship appearance count by winning the age division championship. Barnett hammered home in 2nd, with Zalokar and Atlanta’s Droze in 4th and 5th, with Mora and Enicks in 7th and 8th. Enicks did not mind an 8th place finish; the 65 added points gave him 345 and a healthy lead in the GP. Barnett, Zalokar and Mora were next with 190, 185 and 170. Droze, with his late start, had just the 80 5K points. With only 3 events left and Enicks planning on running the 15K at Tulsa, things were looking good. Zalokar and he contested Tulsa and the Half Marathon result recurred but Enicks’s 95 points for 2nd gave him 440 points and an insurmountable lead. Zalokar 100 points for the win gave him 285 but he was not planning on contesting the final 2 races of the year, both XC races. No one else was within 200 points with only 2 races left. 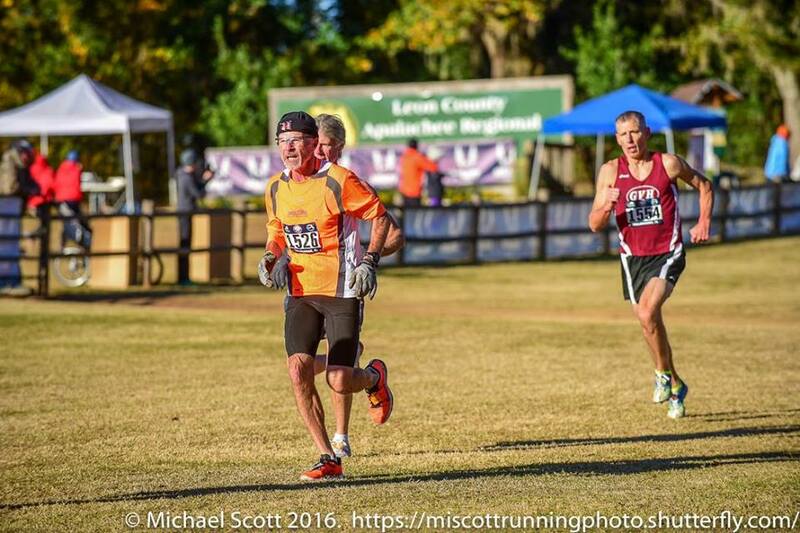 Droze was the only one to run the last 2 races, winning the 5 K Masters XC and finishing 10th at Club XC. When Mora finished 8th that gave both he and Droze 235 points and a tie for 4th. Barnett ran Club XC finishing a strong 2nd behind the legendary Cal Coast runner, Pete Magill, finally putting all his injuries and recovery behind him. Barnett’s 95 points gave him 285 points so he and Zalokar tied for 2nd. M60. 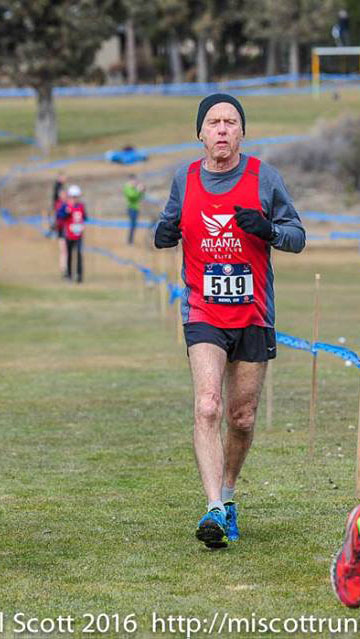 In December 2013 at the USATF Annual Meeting, Brian Pilcher, honored as Masters Runner of the Year, made the motion that led to the establishment of the Individual Grand Prix. I am sure everyone in attendance was thinking to themselves, “I guess I know who’s going to win the GP in the 55-59 division the next couple of years, Pilcher.’ Irony of ironies—Pilcher lost the first two-thirds of 2014 to injury and rehab and did not win the 1st GP title. Just when he was fully recovered and piling up pints in the 2015 GP race, boom, there went the hammie again. Without any races in the 2nd half of the year, Pilcher had to settle for third. Would this year be different? Ninety-six runners contested championships in this division. Could Pilcher top them all despite starting the year in recovery mode? His main competitors all got on the board before Pilcher by being ready to run at Bend. GVH’s Mark Rybinski got 95 for 2nd, his teammate, Gary Radford got 85 points for 4th place in the M55 division, while Cal Coast’s John Holcomb got 85 points for 4th in the M60 division. Holcomb’s teammates, Keith Witthauer and Perry Forrester, got 85 and 60 points respectively. Pilcher did get his start at the Brea 8K with 3rd place and 90 points, a sign that he was still in recovery mode. Witthauer’s 6th place gave him a total of 155 points and the lead with Holcomb 5 points back thanks to his 8th place. Forrester jumped into 3rd off of a 12th place finish, giving him 110 points. Pilcher took 2nd at Dedham, netting 95 points and taking the lead. Radford got 4th and 85 points for 170, leaving him in 2nd ahead of Witthauer, Holcomb, Forrester and Rybinski, now nursing an injury, in that order. Pilcher, Radford, and Ry binski all missed the Half marathon in San Diego. That gave Witthauer, Holcomb and Forrester a chance to leapfrog. Holcomb’s 3rd gave him 240 points and the lead; Witthauer’s 5th left him in 2nd 5 points back; and Forrester took 2nd for a total of 205, leaving Cal Coast 1-2-3 in the competition at that point. At Flint, Radford picked up 75 points for his 6th place while Rybinski made his first appearance since Brea, jogging the course for his team but also picking up 60 points in the GP. Heading into the fall, with 4 events left it was very close with Radford leading (245), Holcomb 2nd (240), Witthauer 3rd (235), Forrester 4th (205), Pilcher 5th (185), and Rubinski 6th (155). Would Pilcher come up short again? Pilcher not only came out firing, he was breaking record, taking first at Syracuse in record time, a week before breaking the Half marathon, 25K, and 30K records and tying the marathon mark. That tightened things up still more. Rybinski, starting to race closer to his norm, picked up 80 points for 5th, followed in order by Holcomb, Forrester, Witthauer and, on an off day, Radford. The top 5, Holcomb, Radford, Witthauer, Pilcher and Forrester, were within 40 points of one another. And Rybinski was closing in fast. Pilcher edged closer to the top with a win at Tulsa but with Forrester, Holcomb and Witthauer finishing in 4th, 5th and 6th, he could not quite get there. Holcomb still had ten points on Pilcher with Forrester and Witthauer 25 points back. Pilcher took the win in the last event of the year, that 100 points was his 5th score of the year and vaulted him into 1st place. He finally got his first GP win. By running in both XC events and finishing 2nd and 5th respectively, Radford was able to jump over Holcomb as well. Rybinski picked up a 6th and a 4th in those same 2 events, while Holcomb only ran in Club XC but the 65 points he got for 8th did not increase the total he had from his bet 5 events already. And the tie-breaker rule favored Rybinski who had bested Holcomb each of the times they ran in the same race. That left Holcomb, Witthauer and Forrester in 4th through 6th but they probably did not mind much; they had achieved their main team goal, winning the Club GP. M65. The top point getters in 2015 were Lloyd Hansen, Doc Rappole, Jerry Learned and Michael Reif. Hansen lost the entire year to a mixture of injury, rehab and family responsibilities while Rappole lost a lot to injury and rehab. Reif had fitness issues; only Learned was really in the mix. But he had a tough group to compete with as Doug Bell, Tom Bernhard, Kirk Larson and Peter Mullin all aged up into the M65 this year. Fifty-four runners contested Championship events in this division. Who would rise to the GP top? Learned and Mullin both entered Bend but Mullin had to withdraw due to family responsibilities; Learned ran for Atlanta, netting 3rd place and 90 points for the early lead. All of the top 5 GP contenders except Larson competed at Brea with Bell of the Boulder Road Runners taking the 100 points for 1st, Bernhard 95 for 2nd and Mullin 90 for 3rd. Learned picked up 80 points for 5th and remained in the GP lead. Atlanta’s Larson made his first appearance at Dedham where he was joined by Bell, Learned and Mullin. Larson and his teammate, learned picked up 75 and 65 points for 6th and 8th while Bell and Mullin picked up 95 and 90 for 2nd and 3rd. With one event left in the spring season, Learned was still in 1st with a 40 point lead on Bell and Mullin 15 points further back in 3rd. 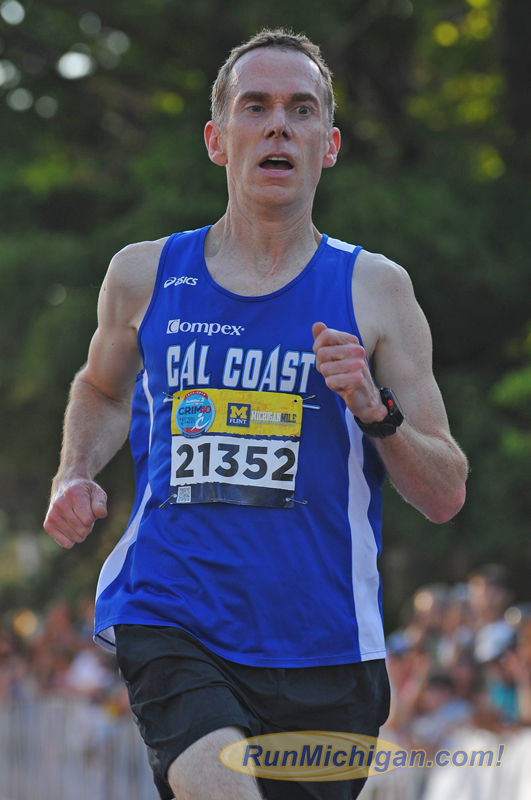 Mullin was the only contender to run in the Half marathon in san Diego. The 100 points he got for his win propelled him into first place. They headed into the summer break with Mullin leading (280), Learned 2nd (235), Bell 3rd (195), Bernhard 4th (95), and Larson 5th (70). The very active 2nd half of the year kicked off with the 1 Mile run in Flint which attracted all of the main contenders except Bell. It was Bernhard, Mullin and Larson 1-2-3 with Learned in 5th. All 5 competed in Syracuse with Bernhard, Mullin, Bell and Larson going 1-2-3-4, with Learned in 6th. Bernhard not only won, he broke the Men’s 65-69 US 5K record. That might suggest he could win the GP but setting records does not necessarily mean a runner will score in enough events to win. Heading into the final 3 events of the year Mullin had a big lead with 470 points. Learned was in 2nd 80 points back. But they were the only two with 5 events in the GP already. Bernhard, Bell, and Larson had 295, 285, and 250 respectively with only 3 events in their total so far. Mullin’s aversion to XC running meant he might well skip the last 2 events and see if anyone could do well enough to catch him. That, in fact, turned out to be his strategy. That he was able to run a 1:26:40 Half Marathon in January 2017 suggests that there were no fitness difficulties keeping him out of the races. Learned would surely run both events but he could only help himself marginally as he already had 5 scores in. Because the Boulder 60’s team was in a tight race with Cal Coast for the Club GP, Bell ran in both XC races. He picked up 195 points for a 1st and a 2nd, vaulting him past Mullin into 1st place and the GP win. No one else could catch Mullin however as he earned the 2nd place finish 10 points back from Bell with 470 points. Larson picked up 170 points with a 2nd and a 6th, moving him 5 points ahead of Learned who improved his earlier total but only by 25 points. Bernhard settled for 5th as he decided to skip the final 2 events of the year. M70-74. Last year Boulder’s Jan Frisby dominated this division in the first 8 months of the year putting up 4 firsts and a 2nd place. After an Achilles flare-up in Syracuse he had to hang on for the win as Shore AC’s Przemek Nowicki got within 15 points. Paul Carlin (yours truly) finished in 3rd with Atlanta’s Ed Bligh and Morris Williams in 4th and 5th. The top 3 were in the mix again this year although they had a newcomer to contend with, track ace, Gary Pattton, who aged up into the group and decided to make a run for the GP. His strategy was to focus on the shorter events, 8K and under, but to also run the 10K to get 5 events in. He intended to shut down his season after the 5K in Syracuse and hope he had gathered enough points. I was now running for the Ann Arbor Track Club so would likely run a lot of events. But I was starting the year in recovery mode. Frisby had taken time off after his Achilles flare-up the previous October and his fitness was not at his usual level. Hall of Famer, Doug Goodhue was also out injured at the start of the year. So things looked pretty good for Patton. That was certainly the impression as he entered Bend and won handily; I picked up 90 points for 3rd. Frisby joined Patton and me at Brea but the outcome was the same with Patton catching me 100 meters from the finish line and outsprinting me to the tape. That gave Patton 200 points from 2 events, me 185 from 2 events and Frisby his first 90 points. Nowicki joined the other 3 at Dedham where I had my best race of the year, claiming the 100 points for 1st, followed by Patton who picked up 95, Nowicki with 90 and Frisby with 85. Patton retained his lead with 290 points to my 280. It looked at this point as if the race would be between those two. I was also aware that should we wind up tied, Patton had the tie-breaker currently in his favor 2-1. Two winning strategies were available to me. First run in as many races as possible in order to get to 500 points. That way I would not have to worry about a tie-breaker. Patton’s strategy, which he had revealed to me, meant that Patton would top out at 490 if he won both the 1 Mile and the 5K. The other strategy would be to skip the 1 mile, try to beat Patton in the 5K to even up the tie-breaker and then win enough events to get to 490 or better. A week after Dedham it was clear to me that I no longer had to worry about those strategies. Last year it was the right hamstring; this year the left hamstring went out. 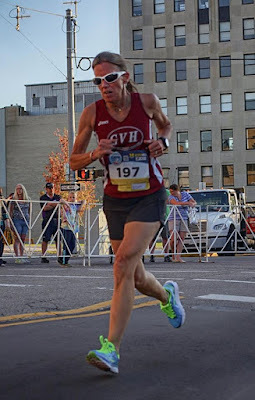 I would go into Physical Therapy and not be able to race until October, although I was able to jog for the team at the 1 Mile in Flint. Nowicki was running well now and picked up a 2nd at San Diego in the Half Marathon for 95 points and moved into 2nd, fifteen points ahead of Frisby. At Flint, Patton got the 100 points he wanted and Nowicki gained 95. I added 60 points for my jog. Heading into the last 4 events of the year, Patton looked good with 390 points, followed by me with 340, Nowicki with 285 and Frisby with 170. At Syracuse Patton’s strategy was fully achieved as he took first. It looked likeImight be able to get 2nd as I was able to close on Nowicki 400 meters from the finish and was just outkicked by a few seconds. My fitness was coming back. With 80 points to Nowicki’s 85, I remained in 2nd, 420 to 365. Frisby picked up 65 points to stay in 4th.But I made a mistake in training between Syracuse and Tulsa, suffering a setback. I then compounded the error by running the 15K at Tulsa anyway. I ran ten minutes slower than last year; even though I got 95 points for 2nd place, I had added to the damage. I had to skip the 5K XC Championship and ran the Club XC at substantially reduced effectiveness. 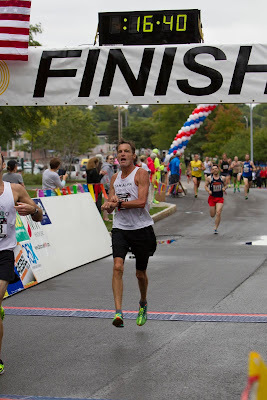 Nowicki took 2nd at the 5K Masters XC and that moved him ahead of me by 5 points, 460 to 455. Nowicki had been struggling with his own fitness issues and now found he could not compete at Club XC. That left an opening for me. If I could finish 4th or higher I would best Nowicki. But the setback I suffered made that impossible. I ran and heled the team to 3rd place in the Club GP but was only able to finish in 8th. Frisby finished 3rd in the Masters 5K XC and came in 2 places ahead of me at Club XC. That still left him in 4th though, 55 points back. The first three finished with 490, 460 and 455 points respectively. M75-79. Last year it was Shore AC’s Roland Cormier, Ron Mastin, Thom Weddle, John Elliott and Hans Schmid. Nineteen runners contested championship events this year, including Elliott and Schmid. But neither of the latter two participated consistently enough to factor in the GP race. Neither Cormier nor Weddle competed this year. This year Mastin had to worry about Ann Arbor’s Philip Kroll, his teammate, Andrew Sherwood and Clifton Roadrunner’s Al Swan. Mastin got off to a great start taking firsts at Bend and Dedham for 200 points through the first 3 events. Sherwood had a 2nd and a 4th for 180 points and Swan had 80 points for his 5th place at Dedham. Kroll got on the board at San Diego with a 2nd place finish and 95 points. Heading into the summer it was Mastin (200), Sherwood (180), Kroll (95), and Swan (80). Kroll prefers longer runs but since the 1 Mile was in his home state, he ran it and garnered 90 points for his 3rd place finish behind Mastin who got 95 for 2nd place despite being in recovery mode. Despite nagging injuries, Mastin netted 80 points for 5th at Syracuse with Swan picking up 75. Heading into the last 3 events of the season, Mastin had a commanding lead with 375 points. Kroll had 185, Sherwood 180 and Swan 155. Second and third were still up for grabs. Kroll staked his claim with a win in the 15K at Tulsa. That gave him a 105 point lead on Sherwood. Kroll did not competein the 5K Masters XC, leaving an opening for Sherwood and Swan t close up the gap. Sherwood got 95 points for 2nd, moving him within ten points of Kroll. Swan’s 3rd left him another 30 points back. Mastin’s 4th place finish gave him 85 points for a total of 460 and the GP win; no one else was within 100 points going into Club XC. Mastin skipped that event but the other 3 contenders were all in. Kroll did not have to beat the other two to win, but beat them he did. He, Sherwood and Swan finished 3rd, 4th and 5th in the race meaning that was their order in the GP as well. Mastin took 1st, followed by Kroll in 2nd. Fifteen points back in 3rd was Sherwood with Swan another 35 points back in 4th. M80-84. Last year no one in this division contested enough events for there to be a GP winner. Ann Arbor’s Jon Desenberg was determined to see a GP winner this year and he would be it! 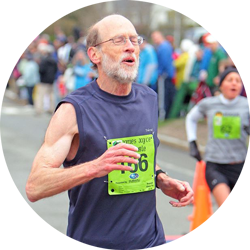 He competed in 4 events, winning his division at Flint, claiming 2nd place at Syracuse and the Masters 5K XC at Tallahassee, and a 3rd place at Dedham. That gave him 380 points and the GP win. The 2016 results are now a part of history. The 2017 Masters Grand Prix kicks off this weekend with the USA Cross Country Championships in Bend Oregon. It should be another great year of competition and friendly rivalries.